A new survey released by the Morning Consult on Wednesday found that America's 10 most popular governors are all Republicans. The survey, which has been conducted quarterly since May 2016, asked registered voters in each of the nation's 50 states to evaluate their governor's job performance. Morning Consult utilized the data provided by respondents to rank the overall approval ratings of the nation's governors between July and September of this year. The results indicated that for the seventh quarter in a row, the country's 10 most popular governors are all members of the Republican Party. The GOP's popularity at the gubernatorial level transcended the conventional boundaries defined by geography and ideology. Republican governors not only scored impressive approval numbers in conservative states throughout the Deep South and the Plains but also in liberal states on the coasts and in the West. Massachusetts Gov. Charlie Baker (R.), who has consistently been ranked as the nation's most popular governor, remained in first place this quarter. 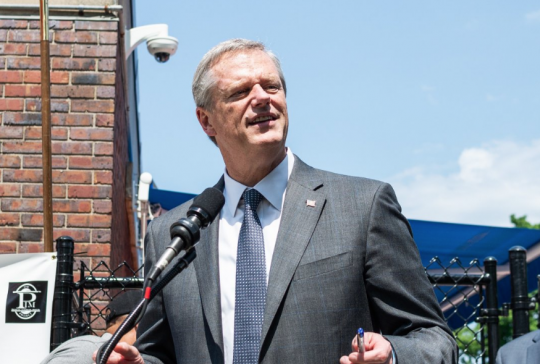 The governor's overall approval rating among Bay State residents stood at 70 percent, a slight increase over his last quarter's approval rating of 69 percent. Baker is heavily favored to secure a second term this year, despite the fact Democratic presidential candidate Hillary Clinton carried the state by nearly 30 points in 2016. Likewise, Republican governors like Brian Sandoval (Nev.), Chris Sununu (N.H.), and Larry Hogan (Md.) garnered top ranking, despite coming from states carried by Clinton in the last presidential election. Apart from Baker, five other Republican governors who made the top ten list, including Greg Abbott (Texas), Asa Hutchinson (Ark. ), and Kay Ivey (Ala.), are vying for re-election this year. The party was also disproportionately represented in the bottom of the list, with Republicans taking seven out of 10 of the spots for the nation's least popular governors. Oklahoma Gov. Mary Fallin (R.) had the distinction of being the least popular chief executive this quarter—garnering a disapproval rating of 75 percent among her fellow Sooners. Democratic Gov. Dannel Malloy (Conn.) wasn't far behind Fallin, garnering the number two spot at the bottom of the list with a 70 percent disapproval rating. Neither Fallin nor Malloy are on the ballot this year. This entry was posted in Politics and tagged 2018 Election, Charlie Baker, Governor. Bookmark the permalink.